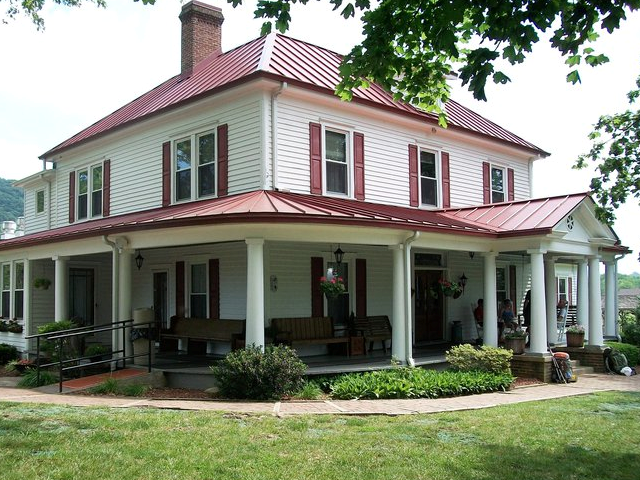 Growing up in Salem I had heard about the Homeplace restaurant many times but I had never actually been there. I think the reason that I had never been there is because my mother and aunt’s cooking has always been so extraordinary we rarely ever went out to eat. On Sunday afternoons most families where I’m from go out to eat but we all go to my Grandparent’s house and eat a big Sunday meal. But the day finally came that I was going to get to try this, supposedly, amazing food. It was Saturday October 8th, me and a couple buddies of mine decided we had eaten enough campus food. So we loaded up in my truck and took off down old Blacksburg Road. The drive was very pretty, the leaves were changing all different types of colors and the mountains looked absolutely gorgeous. I was in the absolute best mood, and to top it all off we were blasting some Alan Jackson through the speakers, he is without a doubt my favorite artist of all time. I almost drove right past the place, it didn’t look like a restaurant to me at all it just looked like a big house. We pulled up the long driveway and to my surprise the place was totally packed. Not only was there no where to park but the wrap around porch was hustling with people. We gave the person at the counter our name and waited for about thirty minutes. I was okay with the wait, we all three sat on a porch swing and chatted with a big family that was waiting. It was evident that this family goes to the home place often by how much they praised the place. Once our name was called we were seated by a nice older woman who made us feel right at home. A waitress asked for our drink orders and recommended the lemonade so we all tried that. Then the food started coming out and let me tell you I started pounding down everything that was in front of me. This place definitely lives up to its reputation, my personal favorites were the mash potatoes with gravy and the fried chicken. Everything about the Homeplace reminded me of things that we have talked about all year pertaining to Appalachia. For instance they were playing bluegrass softly over the intercom system. Another thing that really reminded me of Appalachia were all the different painting and pictures that they had hung up on the wall. There were pictures of coal miners and old farmers everywhere. It was really like a step back in time. The experience was well worth it and I am extremely glad we went. Not only was the food absolutely amazing but eating great country style food deep in the Appalachian Mountains was priceless. On Saturday October 15, 2016 my friends and I loaded up in multiple vehicles and went to Sinkland Farms. It was a beautiful day outside despite it being extremely windy. We were all very excited to get off campus and do something that we typically wouldn’t do. When we arrived there was a long line of cars backed up in the road, it was evident a lot of other people had the same idea as us. We got to the front of the line and a great big man with a beard directed us into the front field off to the right. From there we found our parking spot and unloaded out of the vehicle. As we approached the entrance to the pumpkin patch my nose was delighted. The sweet scent of apple butter and kettle corn being made was enough to make my taste buds tingle. At the gate where you pay to get in the people were extremely nice and welcoming. They then directed us to the hayride that takes you to the actual patch of pumpkins. I felt very comfortable with all of the people running the place, it was very clear they were from the region. While we were waiting for others to board the hayride I struck up a conversation with the man driving the tractor and ended up giving him a dip of snuff. We talked about the upcoming rifle season and how the deer haven’t been moving much recently. I was having a great time, the day was working out wonderfully so far and I felt like I was doing something truly Appalachian. Once we arrived at the patch some of my friends picked out pumpkins, some of the girls with us took an outrageously long time. We let one of my friends dogs off her leash and she ran around with her tail tucked in circles just having a ball. Other dogs began to join in and they began running around and playing it was very fun to watch. I began to talk with one of the other dog owners and my friends got annoyed with me because they wanted to head back to the main part but I can talk dogs for hours on end. After returning back to the main park of the farm we went and checked out the animals. They were all farm related, it is hard to believe that way back when those big pull horses were the only thing people of this region had to farm with. I have been around and worked on as many farms as the next guy and tractors are a really big part of things. It is just a testament to how hard people worked back in the day to provide for their families. Before we left I got some homemade apple butter which is very hard to come by these days. I can’t think of anywhere else I would be able to get apple butter that good. As soon as I got home I began to spread it out on my mom’s homemade bread and ended up eating the whole jar. The experience was truly great. I loved hanging out with my friends and showing them some of the things that Appalachian people truly enjoy. Above is me and my friend Landon at the pumpkin patch. Mr. President I am very honored to have been given the privilege of educating you on this fine region that is Appalachia. It is an extremely great place, filled with great natural resources and some of the best people in the country. I am extremely confident that in just a short time you will be a proud resident of Appalachia. I have lived in this region all my life and I am extremely blessed to call these mountains my home. Recently I took a class on the region called Appalachian Studies. It talked all about the region from music to family life. In taking the course it has shed light on why my family does things the way it does. So after taking this course and living in this region for so long I feel like I am the best person to clue you in on some things around these parts. First I would like to tell you that not everybody that lives in Appalachia is a redneck, there is all kinds of cultural diversity and ethnic diversity. All this diversity came when people were needed from all around the world to work in the coal mines and no one ever left. Now that I got that stereotype out of your head we can move. The next thing I would like to let you know is that family really runs deep around these parts. And what I mean by that is most families that have been in Appalachia for a long time aren’t planning on going anywhere soon. This is extremely evident when you are riding out in the country and you see a street sign that reads, “Gerwin Lane.” That is obviously a road that has nothing but Gerwins living there. You can even experience how tight knit the families are in this region by asking kids about it here at Tech. Most people from the region, especially the more rural parts, have no plans of going anywhere after graduation but back home. The main issue you may face while being in this region is the extreme dependency on drugs. Appalachia does have a serious drug problem that mainly stems from pain killers. The reason for this is because in the heart of Appalachia there is almost no work to do but hard physical labor. And with pain killer prescriptions being easier to get then milk these days a lot of drug problems arise. Drug use habits are often passed down from parents to kids so you are going to have to keep an eye out for the use of drugs on campus. Another issue you may face is having to deal with a lot of students that are extremely poor. All they want is to go to college and be successful but in the mean time they have a hard time paying for food. If you can you should try to make sure that everyone attending this university can afford food one way or the other. A big sensitivity you should have with your students and families from the region is lay offs. Many many people in Appalachia have recently experienced losing there job and for a lot of these people it has taken a toll. Maybe some sort of coping mechanism would be good for students who parents just lost their income? The best way without a doubt this institution can invoke positive change is to set up scholarship opportunities just for kids that come out of the region of Appalachia. The more people we get educated in Appalachia the better off the region will be in the future. I really enjoyed working with a good group of classmates and digging into the different relationships between characters in Trampoline. I always like to observe different family dynamics and this sure was an interesting one. Overall I think our group did a very good job on getting our project ready and then presenting the presentation. I think the way we presented using Instagram was the perfect way to do it as well. It was also very clear our discussion questions were good because they all sparked a class discussion. Why has moonshine remained so popular in the Appalachian region over so many years?